This fuss-free hairstyle works for those times when you are in a rush but still want to look put together. It should only take you a few minutes and will work with any texture of hair. Plus, it easily takes you from your work day to a night on the town. Divide your hair into three sections. It's best to make sure the middle section takes up most of the back of your head so there aren't any weird parts in the final hairstyle. Braid each section in a classic three-strand braid and secure with a clear elastic. You could use any type of braid you want here, but the three-strand braid will be the fastest. 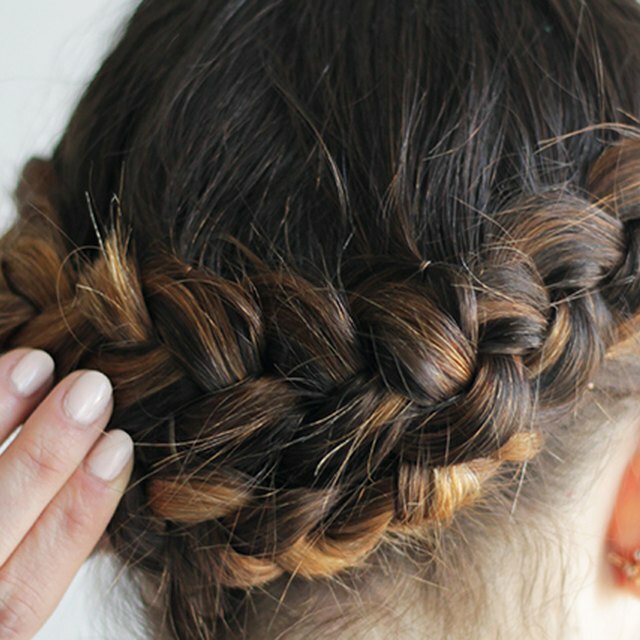 Start with the middle braid and roll it into a bun. Make sure it is rolled right next to your head, and secure it with bobby pins. Once your braid is pinned, you can loosen the bun for a more relaxed look. Use as many bobby pins as you need to assure the bun won't move, and then repeat on the other two braids. Pull out any short hairs around your face for a more delicate look. Pin down any stray hairs and spray the braided buns with hairspray. The shape of your buns will vary depending on your hair thickness and length. Whether you are going to a party or just cleaning the house all day, this hairstyle will make you look and feel great. It has a fun style and can be done almost anywhere at any time. Savannah McNeill graduated with a Bachelor of Art in art, where she explored all things creative and developed her "I can make that" attitude. This inspired her love of tutorials and DIYs, which led to starting a blog with her best friend in 2011 and a clothing line in 2014.